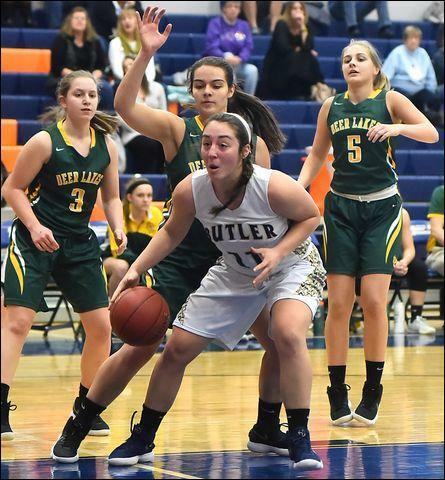 Butler's Alyssa Eyth (11) looks to make a move against Deer Lakes defenders, from left, Anna Solomon, Julia Hollibaugh and Carly Hammers during the Golden Tornado's 49-41 win in the Armstrong Tip-Off Tournament Saturday. KITTANNING — Butler's girls basketball team has a lot to build on following two games in the Armstrong Tip-Off Tournament. A day after losing a 36-35 decision to state-ranked West Shamokin, the Golden Tornado picked up their first win of the season, a 49-41 effort against Deer Lakes. Butler led 28-22 at halftime and never trailed in the second half. Senior guard/forward Jenna Kunst led the victory with 15 points and eight rebounds. Alyssa Eyth added 12 points, Mia Rader 10 points and Julia Gibson contributed six rebounds. The Tornado will open their home schedule Wednesday against New Castle. Anna Solomon 3 0-0 6, Victoria Keibler 1 1-1 3, Abby Buechel 4 0-0 10, Cam Simurda 1 0-0 3, Marie Schmitzer 2 0-0 6, Julia Hollibaugh 1 4-7 7, Alex Stump 1 0-0 2, Emily Mischen 2 0-0 4. Totals: 16 5-9 41. Mia Rader 4 1-2 10, Alyssa Eyth 4 3-3 12, Jenna Kunst 4 6-7 15, Julia Gibson 0 4-6 4, Jordan Kauffman 1 0-0 2, Morgan Gage 0 2-2 2. Totals: 15 16-20 49.